Their sports department produced the first Joola table tennis tables in 1952, but table tennis production expanded so quickly that it became an independent department within the group in 1954 and then transferred to a separate company in 1963 when it moved to nearby Godramstein. In 1973, having moved to their current factory in Siebeldingen the previous year, they extended their range of products and introduced a clothing collection. Additionally, the first Joola blades and rubbers were developed which meant that they could offer a complete range of table tennis equipment. In 1999 Joola Hungary was founded in Kiskoros to produce and deliver metal parts to the German headquarters, as well as successfully selling Joola products throughout Hungary. Today, Joola table tennis equipment is seen at many of the world's top table tennis events. In 1979 Michael Bachtler, who had been responsible for the company as Managing Director since 1968, took over the company. 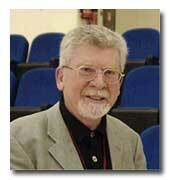 In 2011 I caught up with Michael and asked him a few questions about the Joola brand. Q. Can you give us an insight into the scale of operation of Joola? A. The Joola brand has come a long way since its small beginnings. I remember in 1961 when, as a very young employee, the company founder and I took our tables in an estate car to the German Team Championships in Neuwied and set them up. Back then the tables were still manufactured by hand, but that precision and quality has been maintained to the present day. Nowadays we operate on a worldwide basis with our main office and factory in Germany, a second in Hungary and offices in USA, China, Japan, Korea, France and Italy. Our table tennis tables are made in Germany whilst the rest of our Joola range is made all over the world. 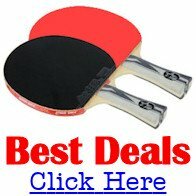 We specialise in table tennis equipment and do not sell any other products. Q. Can you tell us about the senior staff at Joola and their table tennis background? A. Joola staff have a strong connection with table tennis. I've been a player for over 50 years and I'm still playing in a local league for fun. Rade Markovic, our Production Manager, is a former International player and twice national singles champion of Serbia. He currently plays in the 2nd German Federal League. Since 2004, Rade has been working in the department for design and development at Joola and during that time he has tested more than 3000 table tennis blades. Andreas Hain, one of our Directors, plays in the 2nd National League here in Germany and has responsibility for rubber development, not only for elite players but especially for the requirements of club, social and youth classes. We also have other staff members who play at State and local league level. A. We have Joola table tennis agents worldwide. They cover the USA, Canada, South America, Europe, Middle East, Asia, Australia and New Zealand, but if a customer lives in a country where we don't have a Joola agent, they can contact us in Germany and we will handle their order or request for information. 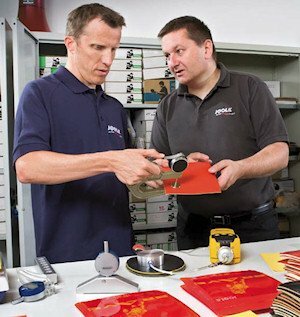 We regularly meet with our agents and they can help us to develop our table tennis equipment, and we can offer them advice about Joola equipment. Q. Can you tell us who Joola table tennis products are designed for? A. Everyone who is a table tennis fan can find the right product within our range of Joola table tennis equipment, whether they are professional players, club players or fun players. Q. 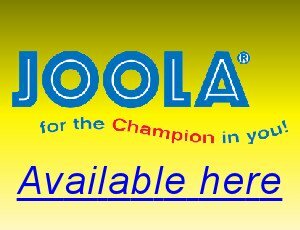 Can you tell us how you promote and advertise Joola table tennis products? A. Joola table tennis tables have been used at many of the top International table tennis events around the world, including the Olympic Games in 1996, 2000 and 2004, plus many European Championships, World Cups and ITTF Pro-Tour events. We also sponsor National Associations, teams, players and clubs around the world, so our brand can be seen worldwide. We also attend trade fairs and table tennis tournaments to promote Joola products and advertise in table tennis magazines and online. A. Our web site www.joola.de	started in 1999 and is constantly updated by our own staff. It has our entire range of products and direct ordering is possible although delivery will be through our local agents. Q. Can you give us an insight into how you develop new Joola products? A. We develop approximately 25 new products each year and our Research & Development team work closely with both professional table tennis players and players of lower standards. For example, Joola rubber development involves testing by players of all standards - including Jorg Rosskopf, Germany's former World Doubles Champion. He works closely with us so that we have a partner who, as a former world class player and now as a successful National coach, contributes up to date expertise from the highest level. We also have material specialists like Chen Weixing and Amelie Solja, who not only co-operate in the testing of equipment, but are actively involved in the development and fine tuning of new products. This means that we are able to produce top quality and popular rubbers for all playing standards. Q. How are the ratings for Speed, Spin and Control for Joola rubbers and blades calculated? A. You are probably aware that a system of numbers for these types of ratings (for example, showing the speed of a rubber as 8.25 out of 10), is without any scientific judgement and is highly subjective. New rubbers are always rated higher than the rubber from last year! That is the reason why we do not use a system of numbers. We believe that our new classification system is easier to understand. For Joola rubbers we use a Speed rating of low, medium, fast or extreme; and Spin and Control ratings of low, medium, high and extra high. For Joola blades, we believe that the decisive factor for classification is speed. Therefore we have categorised our blades into four different speeds / colours. Low is green (used for defensive play), medium is blue (for allround play), fast is red (for offensive play) and extreme is black (for advanced offensive play). This colour classification is also printed onto the blade face and used in the blade handle insert for easy identification. Q. 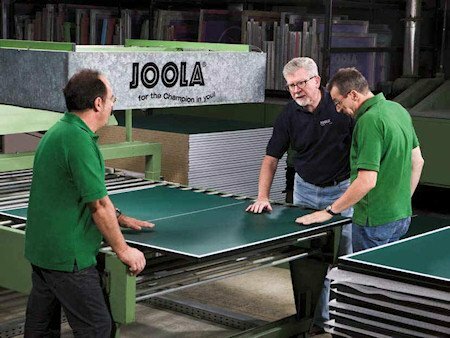 Can you give us an insight into where and how Joola table tennis equipment is made? A. Joola competition table tennis tables are made in Germany, whilst the Joola table tennis tables for the leisure market are made in Germany and China. For our table tennis tables and blades we use wood sourced from Africa, Europe, China and Japan and although the production of our equipment is automated, there are also handmade steps during the production process. Joola table tennis rubbers are made in Germany, Japan and China, and the Joola blades are made in Hungary, China and Japan. We have approximately 50 different Joola rubbers (available in red and in black and in different thicknesses), and we also produce racket cases, balls, clothing, track suits, shoes, socks, bags, hats, bras, towels, robots, nets, court surrounds - in fact everything a player needs.